Podiatric biomechanics (aka MSK or Sports Podiatry) is a specialism concerned with the preservation, restoration, and development of the foot and its associated structures. It is very technical and requires a high level of skill to deal with problems of standing, walking and running. It is the use of this skill in performing a biomechanical examination that enables Podiatrists to identify and treat functional anomalies. There are several causes of pain under the heel, but the most common is a condition where the main ligament that runs along the sole of the foot gets inflamed or damaged, particularly where it inserts into the heel bone. This condition is called plantar fasciitis, and is often helped by rest and the application of ice to the area. It is a complex condition that requires individualised assessment (as there are 40+ possible diagnoses) and a personalised treatment plan by an experienced therapist who can provide all appropriate levels of care. 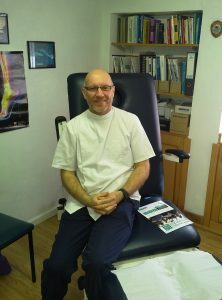 Physiotherapists sometimes try to treat the problem, but plantar fasciitis it is virtually always linked to an anomaly of the mechanics of the feet, which would be helped by a Podiatrist with the provision of appropriate functional foot orthoses (orthotics), rehab programme, and possible shockwave therapy or steroid injection depending on the stage of healing. All of these interventions and more are available at our clinic.